The survival of bacteria largely depends on signaling systems that coordinate cell responses to environmental cues. Previous studies on the two-component ColRS signal system in Pseudomonas putida revealed a peculiar subpopulation lysis phenotype of colR mutant that grows on solid glucose medium. Here, we aimed to clarify the reasons for the lysis of bacteria. We present evidence that the lysis defect of P. putida colR mutant is linked to hunger response. A subpopulation prone to lysis was located in the periphery of bacterial cultures growing on solid medium. Cell lysis was observed in glucose-limiting, but not in glucose-rich conditions. Furthermore, lysis was also alleviated by exhaustion of glucose from the medium which was evidenced by a lower lysis of central cells compared to peripheral ones. Thus, lysis takes place at a certain glucose concentration range that most probably provides bacteria a hunger signal. An analysis of membrane protein pattern revealed several hunger-induced changes in the bacterial outer membrane: at glucose limitation the amount of OprB1 channel protein was significantly increased whereas that of OprE was decreased. 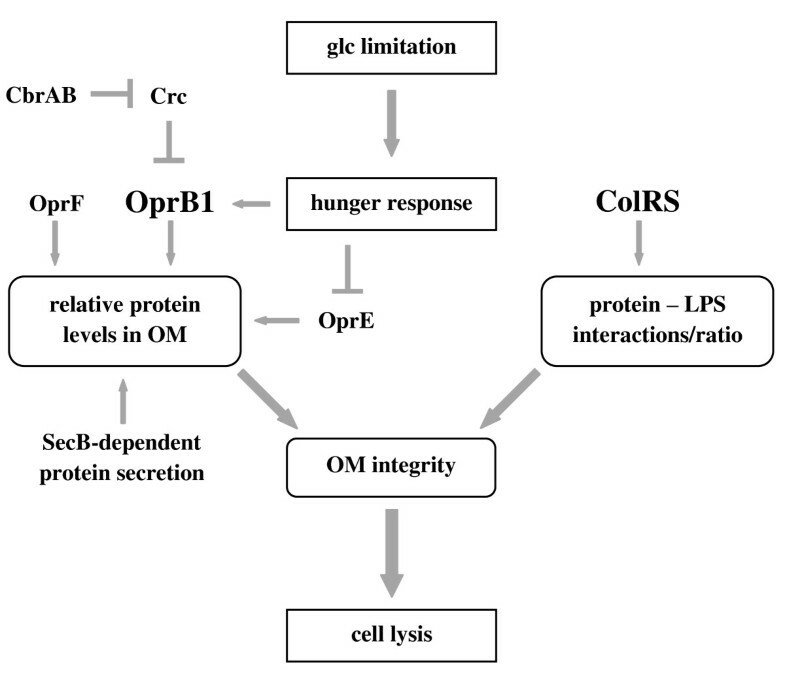 Hunger-induced up-regulation of OprB1 correlated in space and time with the lysis of the colR mutant, indicating that hunger response is detrimental to the colR-deficient bacteria. The amount of OprB1 is controlled post-transcriptionally and derepression of OprB1 in glucose-limiting medium depends at least partly on the carbon catabolite regulator protein Crc. The essentiality of ColR in hunger response can be bypassed by reducing the amount of certain outer membrane proteins. In addition to depletion of OprB1, the lysis defect of colR mutant can be suppressed by the down-regulation of OprF levels and the hindering of SecB-dependent protein secretion. We show that Pseudomonas putida growing on solid glucose medium adapts to glucose limitation through up-regulation of the sugar channel protein OprB1 that probably allows enhanced acquisition of a limiting nutrient. However, to survive such hunger response bacteria need signalling by the ColRS system. Hence, the ColRS system should be considered a safety factor in hunger response that ensures the welfare of the cell membrane during the increased expression of certain membrane proteins. Most bacteria live in constantly changing and often nutritionally limiting environments. The success of bacteria in such conditions depends on their ability to sense the nutritional status of the environment and respond appropriately by reprogramming their gene expression and cell metabolism. For instance, nutrient depletion triggers starvation response that involves the stress-specific sigma factor RpoS and results in drastic changes in gene expression and finally arrests cell growth and division . Bacteria can also discriminate between nutrient-rich and nutrient-poor conditions and respond to nutrient limitation through a regulated nutrient-specific hunger response . Hunger response, activated when the growth rate of a bacterial population decreases due to limited acquisition of nutrients, essentially differs from the starvation response. While the starvation response prepares a cell population for survival in a nutrient-depleted environment, the hunger response improves the ability of bacteria to grow under nutrient-poor conditions . The most obvious bacterial physiological response to low nutrient levels is the enhancement of scavenging ability for the limiting nutrient [2, 4]. For instance, if E. coli is cultivated in glucose-limited chemostat, its permeability to glucose is increased through up-regulation of several outer membrane porins and high-affinity cytoplasmic membrane transporters [5–8]. However, as the rpoS gene was not induced in these conditions, hunger-induced changes should be considered distinct from stationary phase response . Importantly, the mutants that are defective in some hunger-induced transporter have reduced fitness in nutrient-poor conditions [5, 9]. Hunger response has been studied by cultivation of bacteria in chemostat which allows a long-term and almost steady-state growth in nutrient-limiting conditions . However, liquid batch cultures of bacteria also transiently experience a nutrient-limited period just before the exhaustion of the carbon source from the medium. Bacteria that grow on solid surfaces, e.g. on agar plates, encounter specific complications of nutrient acquisition, as during consumption of growth substrates niches with different nutrient level develop, which in turn results in a cellular differentiation and an increase in population heterogeneity . The main difference between growth conditions of bacteria in liquid and on solid media is the development of nutrient concentration gradients during the growth on solid medium. This may significantly influence bacterial responses, as has been illustrated by the spatially and temporally different expression of a reporter gene in Bacillus subtilis [11, 12]. Similarly, nutrient gradients that develop in other types of structured multicellular bacterial consortia, e.g. in biofilms, cause considerable physiological heterogeneity . For example, the P. aeruginosa biofilm was reported to contain subpopulations with different metabolic activity: metabolically active bacteria were found in the upper layer and cells with low metabolic activity in the interior of the biofilm. Interestingly, such metabolic heterogeneity resulted in different adaptation responses as well as varied tolerance to antibiotics among subpopulations . Thus, nutrient gradients strongly affect the behaviour of bacterial population on solid media. Pseudomonas putida is a metabolically versatile bacterium widely distributed in the nature [15, 16]. The comparison of genomes of P. putida and other Pseudomonas bacteria revealed 3,708 shared coding sequences . The genes of the ColRS two-component signal transduction pathway are highly conserved in all Pseudomonas species  and growing evidence shows that the absence of the ColRS two-component system leads to several defects in different pseudomonads. Deficiency in the ColRS system results in the lowered root colonization ability of P. fluorescens [19, 20] and the attenuated virulence of P. aeruginosa . Several ColRS-deficiency related phenotypes are also reported for P. putida, including down-regulation of stationary phase mutational processes , lowered phenol tolerance  and an increased susceptibility of cells to divalent metal ions . We observed recently that under certain circumstances, the ColRS system is essential for the viability of P. putida. The colR-deficient P. putida displays a serious defect on the solid glucose medium where a subpopulation of bacteria lyses as evidenced by the release of cytoplasmic proteins and chromosomal DNA . Intriguingly, the lysis of colR mutant occurs only on glucose and not on any other carbon source. Flow cytometry of propidium iodide-stained cells showed that even though most of the glucose-grown colR-deficient cells were indistinguishable from the wild-type, a minor subpopulation of cells had a seriously damaged membrane permeable to propidium iodide . In the current study we took different approaches to understand i) why only a subpopulation of colR mutant lyses and ii) why the cell lysis occurs only on glucose medium. We identified several mutations that suppressed the lysis phenotype of colR-deficient bacteria and indicated that lysis is caused by hunger-induced changes in the outer membrane composition, including the accumulation of sugar channel protein OprB1. We showed that the degree of hunger response and the lysis of bacteria depend on glucose gradient building up in solid medium during the growth of bacteria - both traits were significantly elevated within the peripheral subpopulation of the colR-deficient strain. We conclude that ColRS system is needed for the proper response of bacteria to glucose limitation and contributes to the maintenance of membrane homeostasis under the increased expression of nutrient scavenging systems. The bacterial strains and plasmids we used are described in Table 1. All experiments were conducted with derivatives of P. putida strain PaW85  which is isogenic to fully sequenced KT2440 . Bacteria were grown on Luria-Bertani (LB) medium  or on minimal medium  containing either 0.2% glucose, 0.2% Na-benzoate or 0.2% gluconate. Some experiments were performed with bacteria grown on media with glucose concentrations of 0.4 and 0.8%. To enhance the lysis of the colR mutant, in some experiments 1 mM phenol was added into the solid minimal medium. Congo Red at 0.0005% was added to the medium for visual evaluation of cell lysis. When selection was necessary, the growth medium was supplemented with ampicillin (100 μg/ml), streptomycin (20 μg/ml) or gentamicin (10 μg/ml) for E. coli and with carbenicillin (1500 μg/ml), kanamycin (50 μg/ml), streptomycin (300 μg/ml), tetracycline (20 μg/ml) or gentamicin (10 μg/ml) for P. putida. P. putida was incubated at 30°C and E. coli at 37°C. Bacteria were electrotransformed following Sharma and Schimke . For the identification of genes implicated in cell lysis, the colR-deficient strain was subjected to mutagenesis using a Tn5 based mini-transposon that contains a streptomycin resistance marker. Mini-transposon-carrying plasmid mTn5SSgusA40 was conjugatively transferred from E. coli CC118 λpir into P. putida colR-deficient strain with the aid of the helper plasmid pRK2013. Transconjugants with random chromosomal insertions of the mini-transposon were selected on 0.2% glucose minimal plates supplemented with kanamycin, streptomycin, Congo Red and 1 mM phenol. We searched for white colonies amongst the pink ones. Screening of about 28,000 transposon insertion derivatives of the colR-deficient strain disclosed 25 clones with significantly reduced Congo Red staining. To identify chromosomal loci interrupted in these clones, arbitrary PCR and sequencing were used. PCR products were generated by two rounds of amplification as described elsewhere . In the first round, a primer specific for the Sm gene (Smsaba - 5'-GAAGTAATCGCAACATCCGC-3') and an arbitrary primer (Arb6 - 5'-GGCCACGCGTCGACTAGTACNNNNNNNNNNACGCC-3') were used. Second-round PCR was performed with the primers SmSplopp (5'-GCTGATCCGGTGGATGACCT-3') and Arb2 (5'-GGCCACGCGTCGACTAGTAC-3'). For the overexpression of OprB1 in the oprB1 and colRoprB1 strains, the PCR-amplified oprB1 gene was first cloned under the control of the tac promoter and lacI q repressor in pBRlacItac. oprB1 was amplified from P. putida PaW85 genome using oligonucleotides oprB1ees (5'-GGCAAGCTTCAAAGGCCGTTGACTCG) and oprB1lopp (5'-TGGTCTAGAGCTCTTGTTGTTTGAGAT) complementary to the upstream and downstream regions of the oprB1 gene, respectively. PCR product was cleaved with HindIII and XbaI and inserted into pBRlacItac opened with the same restrictases. The lacIq-Ptac-oprB1 cassette was excised from pBRlacItac/oprB1 with BamHI and subcloned into BamHI-opened pUCNotKm resulting in pUCNotKm/tacoprB1. Finally, the oprB1 expression cassette was inserted as a NotI fragment into the gentamicin resistance-encoding minitransposon in the delivery vector pBK-miniTn7-ΩGm yielding pminiTn7Gm/tacoprB1. To introduce the oprB1 expression cassette into the chromosome of P. putida PaWoprB1 or PaWcolR-oprB1, we performed triparental mating between P. putida strain, E. coli CC118 λ pir carrying pminiTn7Gm/tacoprB1, and a helper plasmid pRK2013-containing E. coli HB101. Transconjugants were selected on minimal plates that contained gentamicin and streptomycin. The chromosomal presence of the lacI-Ptac-oprB1 cassette of transconjugants was verified by PCR and inducible expression of OprB1 was proved by the OM protein analysis. To disrupt the crc gene, the plasmid pCRC10 was employed . By using triparental mating this plasmid was transferred into P. putida wild-type strain PaW85 as well as into OprB1 over-expression strain PaWoprB1-tacB1. Transconjugants were first selected on tetracycline and streptomycin-containing benzoate minimal plates. Secondary screen was performed on LB plates supplemented with 10% sucrose. Sucrose-resistant colonies were picked up and the disruption of crc was verified by PCR using the primers PPcrcall (5'-ATCGCTACCCGATGATCTGG) and PPcrcylem (5'-TCTTGCTATCGACGATGGCG). To make the transcriptional fusion of gtsA (PP1015) with lacZ reporter gene, we used the promoter probe plasmid p9TTBlacZ. The 980-bp-long gtsA promoter region was amplified from P. putida PaW85 chromosome using oligonucleotides PP1014kesk (5'-GCTGTCGACGCCAATACGCT) and PP1015alg (5'-GCATCTAGACGAAGCGTGGAATTCATC). The PCR-amplified DNA fragment was cleaved with HincII and XbaI and ligated into SmaI-XbaI-opened p9TTBlacZ, yielding p9TT1015. β-galactosidase activities were measured either from solid or liquid medium-grown bacteria. For the analysis of gtsA promoter, total enzyme activity was measured using permeabilized cells as described elsewhere . To evaluate the cell lysis of the colR mutant, we have previously used so-called unmasked β-galactosidase assay which relies on the detection of a cytoplasmic enzyme β-galactosidase leaked out from the cells [25, 34]. In this assay we measured the β-galactosidase activity in suspension of cells permeabilized with SDS and chloroform (total activity), and also in intact, non-permeabilized cells. The percentage of unmasked β-galactosidase activity was calculated from equation: xn/xp × 100%, where xp is β-galactosidase activity measured in SDS and chloroform-treated cells, and xn is β-galactosidase activity measured in non-permeabilized cells. We have shown earlier that in case of ColR-deficiency-dependent cell lysis, unmasked β-galactosidase values are above 5% . As a source of β-galactosidase, the plasmid pKTlacZS/C containing the lacZ gene, was used . Bacteria were grown for 24, 48, or 72 hours on glucose (0.2, 0.4, or 0.8%) or gluconate (0.2%) M9 minimal media. To enhance lysis, 1 mM phenol was added to the growth medium in some experiments. Bacteria were scraped off the agar plate using plastic swabs and suspended in M9 solution. Optical density of the cell suspension was determined at 580 nm and β-galactosidase activity was measured . For the isolation of outer membrane proteins (OMPs) bacteria were grown for 24 hours on two Petri plates. Bacteria were scraped off the agar and suspended in 3 ml of 10 mM HEPES buffer (pH 7.4). For the analyses of peripheral and central subpopulations, bacteria were grown on agar plate in sectors as pictured in Results. To collect enough cells from the sectors, five to ten plates were used, i.e., cells from 15 to 30 sectors per strain were collected and suspended in 3 ml of 10 mM HEPES buffer (pH 7.4). Cells were disrupted by ultrasonication and the cell debris was pelleted by centrifugation at 10 000 g at 4°C for 10 minutes. The supernatant was then centrifuged at 100 000 g at 4°C for 1 hour to pellet membrane proteins. In order to dissolve inner membrane proteins the pellet was resuspended in 2 ml of 10 mM HEPES buffer containing 1% of N-lauroylsarcosine (sodium salt) and incubated at 37°C for 30 minutes. Samples were then centrifuged at 100 000 g at 4°C for 1 hour and the pellet containing OMPs was washed with 3 ml of 10 mM HEPES buffer. After final centrifugation at 100 000 g at 4°C for 1 hour the pellet was suspended in 100 μl of 10 mM HEPES buffer. Protein concentration was measured using the Bradford assay. Two to four independent OMP preparations were made from each strain grown in particular conditions. OM proteins were resolved by SDS-PAGE and visualized by Coomassie Blue staining. The band of interest was excised from the gel and in-gel digested with modified sequencing grade trypsin (Promega), as in . Peptides from in-gel-digested samples were purified with StageTips  and analyzed by LC-MS/MS using an Agilent 1200 series nanoflow system (Agilent Technologies, Santa Clara, CA) connected to a LTQ Orbitrap classic mass spectrometer (Thermo Electron, Bremen, Germany) that was equipped with a nanoelectrospray ion source (Proxeon, Odense, Denmark). Up to five data-dependent MS/MS spectra were acquired in centroid in the linear ion trap for each FTMS full-scan spectrum. Fragment MS/MS spectra from raw files were extracted as MSM files and then merged to peak lists by using Raw2MSM version 1.7  selecting the top six peaks for 100 Da. MSM files were searched with the Mascot 2.3 search engine (Matrix Science, London, UK) against the protein sequence data base composed of Pseudomonas putida KT2440 sequences and common contaminant proteins such as trypsin, keratins, etc. Bacteria were grown in three distantly located sectors on minimal agar medium containing 0.2, 0.4 or 0.8% glucose. After 24, 48, and 72 hours of growth residual glucose concentration in the agar was determined. Using sterile 1-ml pipette tips, small plugs were cut from two regions of the agar plate - just adjacent to the growth area of bacteria and underneath the cells. To excise a plug from underneath the growth area, the cells were first scraped off. Agar plugs were melted at 100°C and cooled to 65°C. Glucose content in melted agar was determined with Glucose Liquicolor kit (Human GmbH, Germany) according to the instructions of the manufacturer. To specify the requirements for the glucose-related lysis of the colR-deficient P. putida, cell lysis was measured at different time points of growth both on solid and in liquid media with either glucose or gluconate as a carbon source. Cell lysis was evaluated in previously described assay  that measures cytoplasmic β-galactosidase leaked out from the cells (unmasked β-galactosidase activity, see Methods). Absence of ColR resulted in cell lysis only on glucose-containing solid medium and not in the liquid one (Figure 1). We observed an increase of cell lysis of the colR mutant in time until 48 hours of growth, and thereafter the unmasked β-galactosidase activity stabilized at the level of about 12% of total β-galactosidase activity (Figure 1). In good accordance with our previous results, colR-dependent lysis did not occur on gluconate medium . These data suggest that ColRS system is particularly important for P. putida that grows on glucose solid medium. Unmasked β-galactosidase activity as indicator of cell lysis. The data present percentage of β-galactosidase activity, measured from non-permeabilized cells against the total β-galactosidase activity determined from permeabilized bacteria. Results for P. putida PaW85 (wt) and colR-deficient (colR) strains measured at 24, 48 and 72 hours are shown. Bacteria were grown for three days either on solid or in liquid M9 minimal medium with 0.2% glucose (glc) or gluconate (gn) as carbon sources. Data (mean ± standard deviation) of at least three independent determinations are presented. In order to identify the genes involved in the glucose-dependent cell lysis, the colR-deficient strain was subjected to transposon mutagenesis to isolate suppressor mutations. In this screen the ability of the colR mutant colonies to bind Congo Red was used as a marker for lysis phenotype : white transconjugants were searched among pinkish colR mutant colonies. As cell lysis and Congo Red binding of colR-deficient bacteria are significantly enhanced in the presence of phenol , suppressor screen was performed on glucose minimal plates supplemented with Congo Red and 1 mM phenol. Analysis of about 28,000 transposon insertion derivatives of the colR-deficient strain disclosed 25 clones with significantly reduced Congo Red staining. Sequencing of mini-transposon insertions revealed 12 different suppressor genes, and most of these were picked up more than once (Table 2). The isolated white clones were tested in respect to cell lysis by using unmasked β-galactosidase assay. Data in Figure 2 show that all isolated clones not binding Congo Red also had significantly lower unmasked β-galactosidase activity compared to the parental colR-deficient strain, and most of them behaved exactly like the wild type. Thus, the results of β-galactosidase assay show a clear correlation between Congo Red binding ability and cell lysis confirming that the identified genes are indeed implicated in the glucose-specific lysis of the colR mutant. * The numbers in the brackets denote nucleotides in the coding sequence of particular gene just before the minitransposon insertion. Unmasked β-galactosidase activity as indicator of cell lysis of Congo Red non-binding derivatives of the colR -deficient strain. The data present percentage of β-galactosidase activity, measured from non-permeabilized cells against the total β-galactosidase activity determined from permeabilized bacteria. Results for P. putida PaW85 (wt), colR-deficient strain (colR), and for different transposon insertion derivatives of the colR mutant are shown. Bacteria were grown for 24 hours on solid 0.2% glucose M9 minimal medium containing 1 mM phenol. Data (mean ± standard deviation) of at least three independent determinations are presented. Inspection of identified genes (Table 2) revealed that in accordance with our previous results , disruption of the oprB1 (PP1019) gene did eliminate the lysis. Knockouts of sugar transport genes located upstream of oprB1, i.e., gtsA (PP1015), gtsB (PP1016), and gtsD (PP1018) also suppressed the lysis phenotype of the colR mutant. In addition to sugar transport genes, lysis was also suppressed by inactivation of the two-component system CbrA-CbrB, which is known to regulate several catabolic pathways and the cellular ratio of carbon to nitrogen [39, 40]. The death of the colR mutant was also prevented by the knockout of a sigma factor SigX, which regulates expression of major outer membrane protein OprF in Pseudomonas aeruginosa and Pseudomonas fluorescens . Consistent with that, inactivation of oprF also suppressed lysis of the colR mutant. It is noteworthy that the disruption of the SecA and SecB components of the general Sec protein secretion pathway also eliminated the lysis (Table 2). The isolation of a secA-knockout in our screen was particularly surprising because SecA has been shown essential not only for Sec pathway but also for the viability of bacteria . Sequencing of two independently identified secA mutants revealed that they both possessed minitransposon insertion at the very end of the secA gene - between 37 and 38 nt from the stop codon (Table 2). Therefore, these mutants most probably coded for a truncated SecA protein lacking the last 12-13 amino acids. The most distal C-terminal part of SecA is necessary for its binding with SecB, a chaperone which keeps precursor proteins in translocation-competent state and targets them to SecA . Literature data shows that although SecA is essential for bacteria, its SecB-binding domain is dispensable for protein secretion and cell viability [43, 44]. Thus, we consider that the secA mutants that were picked up in our suppressor screen are impaired only in SecB-dependent protein secretion and in respect of the cell lysis phenotype they resemble secB-knockouts. Finally, unique insertions of transposon into PP1585 and PP4236, coding for putative antidote protein of a toxin-antitoxin system and a thiol:disulfide interchange protein, respectively, also resulted in white non-lysing colonies of the colR mutant. In conclusion, inactivation of different genes prevented lysis of the colR mutant and most of these genes encode either membrane proteins or are implicated in regulating membrane proteins. The results of the suppressor analysis predict that the colR mutant cannot maintain membrane protein homeostasis. This is supported by two phenomena. First, the reduction of protein secretion by the inactivation of the SecB-dependent protein export suppresses cell lysis. Second, the disruption of genes for the outer membrane porins, OprB1 and OprF, also eliminated the lysis indicating that the outer membrane (OM) composition may be unbalanced in the colR-deficient P. putida. In order to address this issue we compared the pattern of OM proteins of the wild-type and the colR mutant as well as the suppression mutants of the colR strain. Data in Figure 3 demonstrate that the overall OM protein pattern of the wild-type and the colR strains is similar. The PP1585, PP4236, secA and secB derivatives of the colR mutant also have OM protein profiles that are quite similar to the wild-type. However, as expected, OM protein preparations of the colRoprB1 and colRoprF mutants respectively lacked OprB1 and OprF channel proteins. Note that OprF is represented by several differently migrating forms. This is consistent with previous data on several OM porins, including OprF of P. aeruginosa, showing that these proteins are prone to modification by heat and β-mercaptoethanol treatment that is carried out for the solubilization of proteins before applying to the gel . Given that sigX and oprF genes comprise one operon and that OprF is positively regulated by SigX in P. aeruginosa and P. fluorescens , it was expected that all four different colRsigX knockout strains have significantly lowered OprF amount in their OM (Figure 3, only two colRsigX derivatives are presented). However, while three sigX derivatives of the colR mutant (minitransposon insertions after nucleotides 251, 304 and 336 of the sigX gene) revealed only modestly reduced expression of OprF (Figure 3, only colRsigX336 is presented), the colRsigX strain with most distal transposon insertion in sigX, displayed drastically decreased OprF level (Figure 3, see colRsigX480). An analysis of the sugar transport gene knockouts (PP1015, PP1016 and PP1018) showed that they all possessed a significantly decreased amount of OprB1. Thus, disruption of the genes located upstream of oprB1 seems to have a polar effect on the OprB1 expression. Actually, this is in good agreement with recent results reporting that sugar transport genes comprise one transcriptional unit with oprB1 . 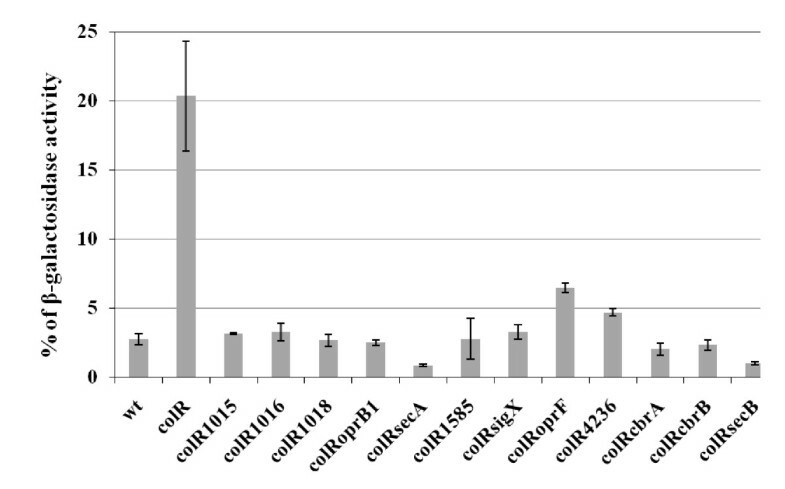 OM fractions of colRcbrA and colRcbrB mutants were generally similar to the wild-type and the colR mutant, but still had slightly less OprB1 protein than the parental strain. Thus, OM analysis shows that although the pattern of OM proteins of the colR mutant resembles that of the wild-type, its defects can be suppressed by decreasing the amount of OprB1 or OprF in OM. SDS-PAGE of outer membrane protein preparations stained with Coomassie Blue. OM proteins were extracted from 24-hour-old populations of bacteria grown on solid minimal medium with 0.2% glucose. Representative results of the P. putida PaW85 (wt), colR-deficient (colR), and of different transposon insertion derivatives of the colR-deficient strains are shown. Arrows indicate locations of the channel proteins OprB1 and OprF (calculated molecular weights 49.6 kD and 37 kD, respectively). All lanes contain 0.5 μg of OM proteins. The analysis of the OM protein pattern of transposon mutants suggested that the colR-deficient P. putida cannot tolerate the natural load of membrane proteins, at least that of OprB1 and OprF when growing on glucose solid medium. Here, it is important to note that the colR mutant is prone to lysis specifically on glucose but not on gluconate  despite both these substrates are degraded through Entner-Doudoroff pathway. While most of the genes for glucose and gluconate metabolism are induced by both these carbon sources, one of them, oprB1, is specifically expressed only during glucose growth [46, 47]. Our results also show that OprB1, a major OM protein in glucose-grown cells, is not detectable in gluconate-grown P. putida (Figure 4A). Therefore, we hypothesized that the glucose-induced expression of OprB1 could be the major determinant of glucose-specific cell lysis of the colR-deficient bacteria. If so, then artificial overexpression of OprB1 should result in the cell lysis of the colR mutant on both the glucose and the gluconate medium. To test this assumption, we introduced an extra copy of the oprB1 gene under control of IPTG-inducible tac promoter to the oprB1-deficient strains PaWoprB1 and PaWcolR-oprB1. The oprB1-deficient background was used to avoid an unequal amount of OprB1 in glucose and gluconate growing cells due to glucose-specific induction of the native oprB1 locus. The OM analysis of PaWoprB1-tacB1 and PaWcolR-oprB1-tacB1 strains revealed that induction of tac promoter with 0.5 mM IPTG resulted in equal OprB1 expression in both strains and in case of both carbon sources (Figure 4B). OprB1 protein was not detected in cells without IPTG-induction (not shown). 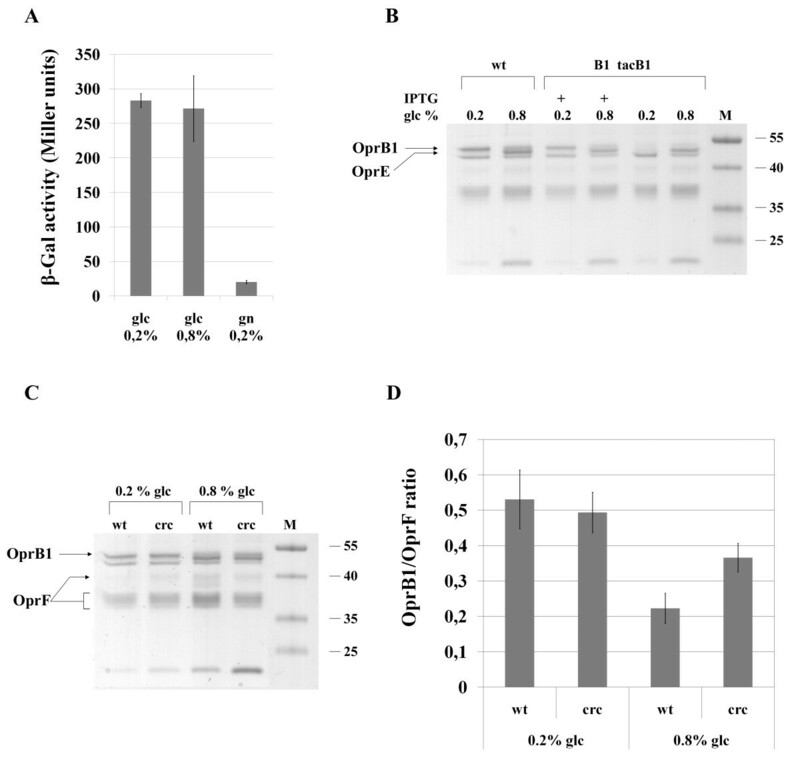 Unmasked β-galactosidase activity assay demonstrated that overexpression of OprB1 caused the lysis of the colR mutant also on the gluconate medium (Figure 4C), which confirms the importance of the amount of OprB1 in OM as a major determinant of cell lysis. Furthermore, even the colR-proficient PaWoprB1-tacB1 strain did not tolerate the artificial overexpression of OprB1, revealing a clear lysis phenotype on both carbon sources. This data suggests that OM is highly sensitive to the abundance of OprB1 and obviously the natural amount of OprB1 induced by glucose is close to the saturating level that the bacterium can tolerate. Effect of the OprB1 overexpression on the profile of outer membrane proteins and cell lysis. A and B. SDS-PAGE of outer membrane protein preparations stained with Coomassie Blue. Representative results of the P. putida PaW85 (wt), oprB1-deficient (B1) as well as OprB1-overexpressing strains PaWoprB1-tacB1 (B1tacB1) and PaWcolR-oprB1-tacB1 (RB1tacB1) are presented. OM proteins were extracted from 24-hour-old populations of bacteria grown on solid minimal medium with either 0.2% glucose or gluconate. OM proteins presented in panel B have been purified from the cells which were grown in the presence of 0.5 mM IPTG. Plus (+) marks above the lanes designate a particular carbon source added to the growth medium. Arrow indicates location of OprB1. C. Quantification of cell lysis by the unmasked β-galactosidase assay. Bacteria were grown for 24 hours on solid 0.2% glucose (glc) or 0.2% gluconate (gn) minimal medium containing 1 mM phenol (+phe). For the induction of OprB1 0.5 mM IPTG was used. Data (mean ± standard deviation) of at least three independent determinations are presented. Two remarkable features of the glucose-specific cell lysis of the colR-deficient strain are that it can be observed only on solid medium (Figure 1) and that only a fraction of population lyses  indicating heterogeneity among the bacteria. Therefore we decided to test the effect of the location of cells in a population on their lysis. For that, the colR-deficient bacteria were grown on agar plates with 0.2% glucose and lysis was analysed in cells withdrawn from two different regions of bacterial lawn on agar plate sectors - the periphery and the centre. Bacteria were streaked as shown in Figure 5A to enhance the build-up of nutrient gradients. 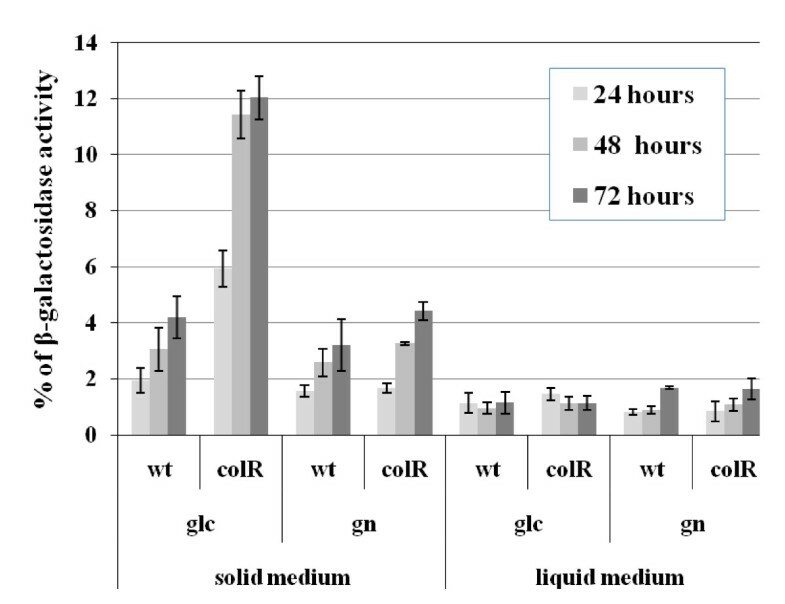 Unmasked β-galactosidase activity measured at 24, 48 and 72 hours of growth clearly indicated that at every time-point the lysis of colR mutant was always significantly higher among peripheral cells of the bacterial lawn compared to the central subpopulation (Figure 5B). Also wild-type bacteria revealed spatially different unmasked β-galactosidase activity demonstrating up to two-fold higher enzyme values at 48 and 72 hours in case of peripheral cells (Figure 5B). Comparison of lysis of peripheral and central subpopulations of P. putida PaW85 wild-type (wt) and colR -deficient (colR) strains grown on solid glucose medium. A. Representation of a Petri plate with three growth sectors of bacteria and subpopulations sampled for β-galactosidase analysis. Unmasked β-galactosidase activity was assayed from the cells of peripheral subpopulation (area encircled by the dotted line and indicated by the white arrow) and from central one (indicated by the black arrow). Black circles indicate the areas sampled for the measurement of residual glucose concentration in the medium (data is presented in Table 3). The degree of lysis is presented as unmasked β-galactosidase activity which was measured from bacteria grown either 24, 48 or 72 hours on solid media with 0.2% (B), 0.4% (C) or 0.8% (D) of glucose (glc) as the carbon source. Due to the spatiotemporal character of the lysis of the colR mutant we hypothesized that nutrient limitation could be involved in cell death. During the active growth of bacteria on agar plate the concentration of glucose in the growth area decreases, yet, it is obvious that compared to the central population the peripheral cells are nutritionally less limited due to diffusion of glucose from the adjacent medium. To evaluate the glucose consumption dynamics during 72 hours of bacterial growth on 0.2% (9 mM) glucose solid medium, we measured the glucose concentration in the growth agar by sampling the regions underneath the cell lawn and adjacent to the bacterial growth area (sampling regions are indicated in Figure 5A). Already at 24 hours of growth, the amount of glucose in the medium underneath the bacterial lawn had dropped below the detection level of the assay (0.1 mM). Concentration of glucose in the medium adjacent to the growth area continuously dropped down to 1.6 mM by 72 hours of growth (Table 3). These results show that bacteria constantly consume glucose that is diffusing from adjacent region of agar plate and that peripheral population of bacteria has to adapt to gradient of glucose. Notably, glucose consumption dynamics for the wild-type and the colR mutant were similar. Accumulating evidence indicates that bacteria growing under subsaturating nutrient levels express a transient response called hunger response, which helps them to cope with limiting conditions . The most obvious feature of hunger response is up-regulation of nutrient uptake systems, including several OM porins [3, 5]. This lead us to hypothesize that elevated lysis of peripheral cells on 0.2% glucose plates resulted from the hunger response of bacteria while central cells were already starving at that time and therefore showed only minimal hunger response. If so, then the lysis of peripheral cells should be suppressed by increasing the glucose concentration in the medium. Thus, we assessed the cell lysis of peripheral and central subpopulations under different glucose concentrations. Data in Figure 5C and 5D clearly shows that the lysis of the colR-deficient strain inversely correlates with the glucose concentration in the medium. While the increase of the initial glucose concentration in the medium up to 0.4% (two-fold) had no effect on the unmasked β-galactosidase activity of the wild-type (compare Figure 5B and 5C), in colR-deficient background this increase significantly reduced the lysis of peripheral cells and eliminated the lysis of central cells (Figure 5C). If the growth medium of bacteria contained 0.8% of glucose instead of 0.2%, then both peripheral and central subpopulations of colR mutant behaved similarly to the wild-type, i.e., showed no ColR-depletion-dependent lysis (Figure 5D). In a parallel experiment we also monitored the glucose concentration in the agar plate and observed that after 24 hours of growth the glucose was already exhausted (residual concentration below 0.1 mM) from underneath the cell lawn even if the initial glucose concentration in the medium was 0.4 or 0.8%. At the same time, the glucose concentration in the adjacent medium was relatively high although it was constantly decreasing over time (Table 3). There was an inverse correlation between the lysis of peripheral cells of colR-mutant and glucose concentration adjacent to the growth area - irrespective of the initial glucose concentration (0.2, 0.4, or 0.8%), the lower the glucose concentration in adjacent region was, the greater was the lysis (Table 3 and Figure 5). If initial glucose concentration in the medium was 0.8%, it did not decrease below 6 mM in the region adjacent to the cell growth area during the experiment (Table 3). This level is obviously too high to initiate the lysis of the colR-deficient strain. This data strongly suggests that particularly the hungry fraction of the colR mutant is liable to lysis. After establishing conditions which enhance (peripheral growth) and diminish (higher glucose concentration) the lysis of colR mutant cells, we asked whether we can see some changes in the OMP composition under respective conditions. As the abundance of OprB1 in OM was promoting cell lysis, we hypothesised that the level of OprB1 may inversely depend on glucose concentration. To test that, we analysed the pattern of OM proteins of the wild-type and the colR-deficient bacteria grown on agar plates with different concentrations of glucose. Analysis of OMP fraction purified from peripheral subpopulations revealed a dissimilar OM protein pattern for bacteria grown at different glucose concentrations (Figure 6A). First, the OM preparations of bacteria grown at 0.4 or 0.8% of glucose revealed an additional OM protein (~50 kD) that was barely detectable in the membrane preparations of bacteria grown at 0.2% of glucose. A similar pattern was observed also for the OMP preparation of central cells (data not shown). Mass spectrometric analysis identified this hunger-repressed protein as OprE encoded by PP0234 (Figure 6A). Second, the amount of OprB1 inversely correlated with initial glucose concentration in agar plates being highest at 0.2% and lowest at 0.8% of glucose (Figure 6A). Note that the differences observed for OprB1 amounts in OM correlated well with the lysis data of the colR mutant on different glucose plates (Figure 5). All these results support the hypothesis that an elevated expression of OprB1 due to nutrient limitation generates membrane stress that is not tolerated by the colR mutant and results in the lysis of most vulnerable subpopulation of bacteria. Profiles of the outer membrane proteins of the P. putida PaW85 (wt) and the colR -deficient (colR) strains under different growth conditions. OM proteins were purified from the solid medium-grown P. putida PaW85 (wt) and colR-deficient (colR) strains cultivated on the agar plate sectors as illustrated in Figure 5A. A. OM protein profiles of 24-hour-old peripheral subpopulations of bacteria grown on solid medium with 0.2, 0.4 or 0.8% glucose. Location of OprB1, OprE, and OprF is indicated by the arrows. B. OM protein profiles of peripheral and central subpopulations grown for 24 hours on 0.2% glucose solid medium. The quantified protein bands are indicated by the arrows. C. The ratio of OprB1 to OprF in different subpopulations of the P. putida wild-type and the colR mutant strains grown for 24 hours on 0.2% glucose solid medium. The OprB1/OprF ratio was calculated from the data obtained from at least two independent protein preparations and from three independent gel runs. Mean values and 95% confidence intervals are presented. When analysing the composition of OM proteins of bacteria grown on 0.2% glucose (conditions that promote lysis), we repeatedly observed a slight difference between the wild-type and the colR mutant regarding the relative proportions of OprB1 and OprF. The colR mutant showed a tendency to have less OprB1 and more OprF in OM than the wild-type. This was most clearly seen when the OM protein profiles of peripheral subpopulations of two strains were compared (for representative results see Figure 6B). In order to quantify the proportions of OprB1 and OprF in the OMP preparations, we analysed the SDS-PAGE images with ImageQuant TL program. 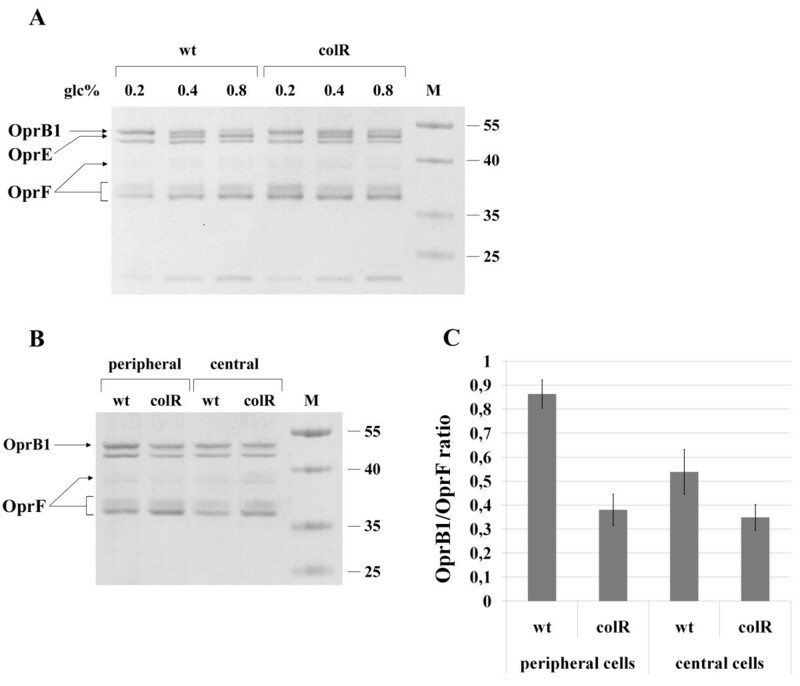 Quantification showed that OM of the wild-type indeed contained relatively more OprB1 than that of the colR-deficient strain (Figure 6C, p = 8,6e-07 and p = 6,8e-04 for preparations from peripheral and central cells, respectively). Furthermore, the relative amount of OprB1 was higher in peripheral wild-type cells compared to that of central cells (p = 6,2e-05), indicating the elevated hunger response of peripheral cells. Differently from the wild-type, the OprB1/OprF ratio for the peripheral and the central cells of the colR mutant was similar. We suggest that the increased level of OprB1 in OM that is normally induced in response to glucose limitation is unbearable to the colR mutant and therefore does not rise above a certain threshold level. To test the possibility that expression of OprB1 under glucose limitation increases due to enhanced transcription of glucose transport operon (genes gtsA to oprB1), the transcriptional fusion of gtsA with lacZ reporter was constructed and analysed under different glucose concentrations. Results in Figure 7A show that the expression of the gtsA promoter is induced by glucose regardless of its concentration. This was also confirmed in the liquid glucose medium by β-galactosidase measurements throughout the growth (data not shown). To find out whether OprB1 expression may be regulated post-transcriptionally we employed the PaWoprB1-tacB1 and PaWcolR-oprB1-tacB1 strains with oprB1 gene under the control of IPTG-inducible tac promoter. We presumed that if the expression of OprB1 is post-transcriptionally suppressed at high glucose and, vice versa, derepressed under glucose limitation, then it should not be possible to artificially overexpress OprB1 from tac promoter in glucose-rich environment, i.e., on 0.8% glucose medium. As predicted, the tac promoter-originated artificial expression of OprB1 was lower at 0.8% glucose compared to that at 0.2% glucose (Figure 7B). As a matter of fact, it did not exceed the amount of OprB1 characteristic for the wild-type cells growing on glucose-rich medium. This data strongly suggests that hunger-dependent regulation of OprB1 occurs post-transcriptionally. Here, it is relevant to remind that the amount of OprB1 is slightly reduced in cbrA and cbrB mutants (Figure 3) suggesting that the CbrA-CbrB system is involved in the OprB1 regulation. Recently, CbrA-CbrB system has been shown to act as a positive regulator of CrcZ which is an antagonist sRNA of catabolite repression control protein Crc . The RNA-binding Crc is a global translational regulator of catabolite repression in pseudomonads [50–52]. Interestingly, if P. putida grows on amino acid-rich LB medium, the glucose transport genes are repressed by Crc . Furthermore, sequences similar to Crc binding consensus were found in the proximity of the AUG start site of gtsA and oprB1 genes . The Crc protein therefore seemed to be a likely candidate for translational repression of OprB1 in the glucose-rich solid medium. Thus, we constructed the crc-deficient strains and analyzed the effect of Crc inactivation on the amount of OprB1 in OM under glucose-rich (0.8%) and glucose-limiting (0.2%) conditions. Data in Figure 7 (panels C and D) show that Crc indeed affects the relative abundance of OprB1 in OM; yet, this was observed only under glucose-rich conditions in which crc mutant displayed higher OprB1/OprF ratio than the wild-type (p = 8.6e-05). However, although inactivation of crc alleviated repression of OprB1 on 0.8% glucose medium, the OprB1/OprF ratio was still higher on 0.2% glucose medium (Figure 7D, compare results for the crc mutant on 0.2 and 0.8% glucose, p = 6.7e-04). Therefore we conclude that in addition to the Crc some other factor(s) as yet unknown should be implicated in hunger-induced up-regulation of OprB1. Post-transcriptional regulation of OprB1 depends on the glucose concentration. A. β-Galactosidase (β-Gal) activity expressed from the gtsA promoter was measured in the wild-type P. putida grown on solid medium with 0.2 or 0.8% glucose or 0.2% gluconate. B. SDS-PAGE of the outer membrane protein preparations from P. putida wild-type PaW85 (wt) and from OprB1-overexpressing strain PaWoprB1-tacB1 (B1tacB1) grown 24 hours over the whole Petri plate. The growth medium contained 0.2 or 0.8% glucose (glc) as a carbon source. Plus (+) mark above the lane indicates that the bacterial growth medium contained also 0.5 mM IPTG. C and D. Analysis of the effect of the crc inactivation on the hunger-induced up-regulation of OprB1. The outer membrane proteins were prepared from P. putida wild-type (wt) and crc mutant strains (crc) grown for 24 hours as a lawn over the entire Petri plate. The growth medium contained 0.2 or 0.8% glucose (glc). The ratio of OprB1 to OprF was calculated from the data of at least two independent protein preparations and five independent gel runs. Mean values and 95% confidence intervals are presented. Previous studies on ColRS signaling system have revealed a peculiar subpopulation lysis phenotype of the colR mutant grown on glucose solid medium . In this study we clarified the reasons for glucose-specific cell lysis and revealed that the ColRS system is necessary for P. putida to survive the hunger response which includes up-regulation of sugar channel OprB1. Several lines of evidence obtained in this study suggest that the glucose-growing colR mutant experiences envelope stress caused by the accumulation of membrane proteins. This was first indicated by the collection of mutants suppressing the lysis phenotype of the colR-deficient strain. These data demonstrated that the loss of ColR can be suppressed by down-regulation of certain OM proteins like OprB1 and OprF, as well by hindering the SecB-dependent protein secretion. Second, artificial overexpression of sugar channel protein OprB1 further highlighted the specifically increased sensitivity of the colR mutant to this particular OM protein. Although neither the wild-type nor the colR-deficient strain tolerated the elevated expression of OprB1 exhibiting lysis phenotype on both glucose and gluconate medium, the colR mutant was remarkably more affected (Figure 4C). Third, the colR-deficient strain possessed slightly less OprB1 in its OM than the wild-type (Figure 6C), indicating that the membrane of the colR mutant is probably sensitive to accumulation of OprB1. Thus, our data suggest that ColRS is necessary for P. putida to maintain the cell membrane homeostasis and this becomes particularly important during up-regulation of certain OMPs such as OprB1. We detected the glucose-specific cell lysis of the colR-deficient strain only on solid and not in liquid medium (Figure 1). Bacterial population growing on solid medium is highly heterogeneous and it is obvious that bacteria located at the edge of the growth area experience different conditions compared to the cells in the centre of the population. Gradient fields of carbon source as well as of excreted metabolites develop during the growth, putting the cells in the centre of the population under more restrictive conditions than those at the periphery. It has been shown that such gradient fields govern cellular responses of multicellular solid medium populations and regulate development of gene expression patterns in space and time . Our previous results revealed a spatial aspect of ColR-dependent lysis. Colonies of the colR-deficient strain developed central concavities when growing on the glucose medium which we interpreted as an elevated lysis of central population . Here, we proved that the degree of lysis of the colR mutant is spatially different. However, contrary to our expectations the lysis of peripheral cells was significantly higher than that of the central cells. Yet, it is important to point out that in the current study we analyzed the bacteria grown on a sector (1/6 of the Petri plate), the area of which is more than 100 times bigger than that of a single colony. Therefore, the nutrient gradients building up in the medium under central cells of a sector and under the central part of a colony are not really comparable. We suggest that lysis occurs at a certain glucose concentration range and whether this develops in the centre or in the periphery of a population depends on the size of the cells' growth area. This study indicated that the glucose-specific lysis of the colR-deficient P. putida occurs among a subpopulation of cells adapting to nutrient limitation. This was most strongly evidenced by the fact that the degree of lysis depended both on time and glucose concentration. We suggest that the continuous increase of the colR mutant lysis during the first 48 hours of growth on 0.2% glucose solid medium (Figure 1 and Figure 5) is caused by a gradual decrease of glucose concentration. Given that significantly less lysis was observed on 0.4% glucose and that no lysis was detected on 0.8% glucose medium (Figure 5), it is possible to conclude that the ColR-dependent cell lysis occurs only when the amount of glucose decreases below a certain threshold level. However, cell lysis was alleviated also at the exhaustion of glucose which was evidenced by lesser lysis of the central cells compared to the peripheral cells (Figure 4). These data suggest that glucose exhaustion itself is not a trigger of the colR mutant lysis; rather, this mutant cannot respond adequately to a certain glucose concentration range which finally causes cell death. This scenario also allows to explain the absence of the lysis phenotype in liquid glucose medium. Obviously, the period of nutrient limitation is transient in liquid batch culture and could have been easily missed in our experiments. Literature data suggest that bacteria growing under suboptimal levels of nutrient, i.e. under conditions between the feast and the famine, express cellular responses that are significantly different from those of rapid growth and starvation [3, 48]. Under conditions of hunger when a nutrient becomes limiting but is not yet depleted, bacteria increase permeability of the membrane to facilitate nutrient entry. For instance, a significantly increased expression of the OprF porin and the LamB-Mgl high-affinity glucose uptake system is considered to be the hunger response of E. coli under glucose limitation . Analogously, we detected essential nutrient concentration-dependent changes in the OM protein composition of the glucose-grown P. putida. We found that the abundance of the sugar channel OprB1 was significantly increased and that of OprE was drastically decreased under low glucose concentrations (Figure 6A). Interestingly, in addition to being modulated by glucose, the abundance of OprE also responds to anaerobiosis [54, 55] suggesting that this outer membrane channel contributes to the adaptation to various environmental conditions. OprB1 is known to mediate high-affinity glucose transport both in P. putida and P. aeruginosa [25, 56, 57]. While OprB1 is not essential for the glucose transport at higher substrate concentrations, it becomes rate-limiting in nutrient uptake at micromolar (1-10 μM) glucose concentrations [25, 57]. Therefore, the up-regulation of OprB1 at low glucose concentrations can be considered an adaptive response of hungry bacteria to stimulate glucose acquisition. However, our results show that the spatiotemporal expression of OprB1 generates spatiotemporal lethal toxicity for colR-deficient bacteria, which implies that the ColRS two-component system is an essential regulator of the hunger response of the glucose-growing P. putida. Our data demonstrate that the up-regulation of OprB1 in response to hunger is controlled post-transcriptionally and that catabolite repression control (CRC) protein Crc is one of the factors involved in this regulation (Figure 7). CRC is an important global control system in bacteria allowing hierarchical assimilation of substrates under simultaneous presence of several possible carbon sources. Interestingly, while in many bacteria glucose is a preferred carbon source, Pseudomonas prefers organic acids and amino acids to glucose [51, 58]. Recent transcriptomic and proteomic data have revealed that Crc protein inhibits several glucose transport and metabolism genes when P. putida grows in nutrient-rich LB medium . For instance, the inactivation of the crc gene resulted in three times higher abundance of OprB1 in LB-grown cells . Interestingly, it was recently reported that Crc is not important for the growth of P. putida DOT-T1E on glucose as single carbon source and this was explained by dispensability of Crc in the medium lacking nutrients alternative to glucose . However, our data demonstrate that Crc can actually affect the usage of glucose as the sole carbon source because the abundance of OprB1 was shown to be elevated in the crc mutant. Yet, the effect of Crc on the amount of OprB1 was observed only in glucose-rich but not in glucose-limiting conditions (Figure 7D) suggesting that the Crc-mediated repression of OprB1 is probably completely absent in hungry bacteria allowing a full expression of OprB1. Thus, in addition to regulating the hierarchical use of carbon sources in complete medium, Crc is also involved in fine tuning single carbon source assimilation. The up-regulation of the glucose-scavenging OprB1 is the most appropriate behavior of P. putida at glucose limitation. However, "there is no free lunch in nature." Data of this study suggest that hunger response is costly and if not regulated properly, it might be even deadly as judged by the requirement of ColRS signaling. Interestingly, a largely similar cell death phenomenon was recently characterized in E. coli where constitutive expression of the maltoporin LamB resulted in cell lysis in the absence of a functional response regulator OmpR [59, 60]. The authors proposed that cell death resulted from envelope stress involving an imbalance in the lipopolysaccharide/porin composition of the outer membrane and an increased requirement for inorganic phosphate . Analogous scenario can be considered for the colR mutant, as recent studies conducted in P. fluorescens and Xanthomonas citri have indicated that ColRS system is involved in LPS production and/or modification [20, 61]. Our current study describes not only the participation of ColRS system in hunger response of P. putida, but also provides clues to better understand the role of this system in root colonization. It is notable that the colonization defect observed for P. fluorescens ColRS system mutant became evident only under the condition of competition with the wild-type strain . This indicates that the colonization ability per se is not impaired but rather some other population-related trait is hampered in the absence of ColRS signaling. Our results suggest that hunger-induced lysis of a subpopulation may be responsible for the reduced fitness of the colR mutant under competition conditions. Nutrient concentration in the rhizosphere is low  and thereby rhizosphere colonization takes place under condition of hunger . We assume that nutrient limitation may result in the hunger-induced subpopulation lysis of the colR mutant and this obviously will reduce the fitness of colR mutant bacteria in co-cultivation experiments. However, if the colR mutant grows as a pure culture, its colonization ability is not affected because nutrients liberated from lysed cells probably support the growth of surviving population. In the future, it would be very interesting to examine the impact of the ColRS system on the viability of different Pseudomonas species in the rhizosphere. Current study demonstrated that the glucose-growing P. putida responds to a low glucose level by the up-regulation of the sugar channel OprB1, which most probably facilitates nutrient scavenging under hunger conditions (Figure 8). We present evidence that on the glucose-rich medium the OprB1 expression is post-transcriptionally repressed, and carbon catabolite repression regulator Crc is partially responsible for that. Most interestingly, we show that the hunger-induced expression of OprB1 is lethal to bacteria deficient in ColR as deduced from a clear correlation between the amount of OprB1 and the cell death of the colR mutant. However, the glucose-induced death of the colR mutant can be suppressed by reducing the abundance of various membrane proteins such as the OprB1 and OprF as well as excluding the SecB-dependent protein secretion (Figure 8). Thus, the ColRS system could be considered a safety factor of hunger response as it ensures the welfare of cell membrane during increased synthesis of certain membrane proteins. Schematic representation of factors associated with the glucose concentration-dependent cell lysis of the colR -deficient P. putida. We are grateful to Niilo Kaldalu for fruitful discussions and advice. We thank Tiina Alamäe, Hiie Saumaa, Maia Kivisaar, Paula Ann Kivistik, and Hanna Hõrak for their critical reading of the manuscript. We thank Riho Teras for plasmid pUCNotKm, Olga Šapran for the assistance in cloning, and Liisa Arike for protein identification. Mass spectrometric analyses were supported in part by the European Regional Development Fund through the Center of Excellence in Chemical Biology (Institute of Technology, University of Tartu). This work was supported by the grant 7829 from the Estonian Science Foundation and by Targeted Financing Project TLOMR0031 from the Estonian Ministry of Research and Education. MP and RH prepared design of experimental work. MP carried out transposon mutagenesis screen and participated in OMP analysis. AA purified OMPs and did OMP pattern analysis. HI constructed mutant strains and contributed enzyme assays. RH performed lysis assays, coordinated experimental work and wrote the manuscript. All authors participated in manuscript editing and approved the final manuscript.